These are ingredients which are often used in Japanese cooking. Japanese short grain rice gets slightly sticky when it's cooked. 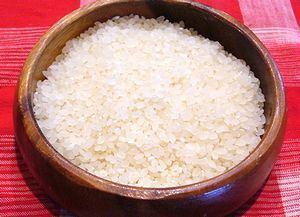 Unpolished rice (short grain brown rice) is called genmai in Japan. Since the embryo and the bran layer aren't removed, genmai is more nutritious than polished rice (white rice). Abura-age is deep-fried tofu. It's pouched. Atsuage is deep-fried thick tofu known as tofu cutlet. Nori is edible seaweed and usually indicates sheets of dried nori which are commonly used for making sushi rolls. Katsuobushi are dried bonito flakes which are used to make dashi soup stock. Also, they are used as toppings in various dishes. Azuki are small and dark-red colored beans. They are simmered to make anko (sweet bean paste) which is an essential ingredient in traditional sweets. Shimidofu are freeze-dried tofu. They are also called koyadofu. Soak shimidofu in water to soften before cooking. Chikuwa is a tube-shaped fish cake. Fish paste are mixed with seasonings and are steamed to make chikuwa. Harusame are transparent noodles made from potato starch or mung bean starch. They are known as bean threads or cellophane noodles. Natto are fermented soybeans by natto bacillus. They are sticky and have strong smell. Natto are often served in Japanese-style breakfast. Kombu (kelp) are widely consumed seaweeds in Japan and are commonly used to make dashi soup stock in Japanese cooking. Wakame is the most popular seaweed eaten in Japan. Konnyaku are gray or white slick products made from konnyaku yams. They are usually sold in rectangular blocks. Konnyaku don't have much taste. Bamboo shoots are called takenoko and are often used in Japanese cooking. Narutomaki is a kind of Japanese fish cakes. Kanpyo are dried long strips of gourd. Simmered kanpyo are often used as fillings in sushi rolls. Niboshi commonly indicate dried sardines which are traditionally used for making dashi soup stock. Kiritanpo is a cylinder-shaped rice cake. It's a speciality food of Akita region, Japan. Kamaboko are semi-cylinderical shaped fish cakes. They are often used as toppings in noodle dishes, such as udon in hot soup. Fu is made from gluten of wheat flour. There are various shapes and colors of baked fu. Fu is often used in nimono (simmered dishes), soup, and so on. Kiriboshi daikon are dried strips of daikon radish. They are soaked in water before cooking. Hoshi Shiitake are dried shiitake mushrooms. Tororo kombu are thin and long sheets or flakes of konbu. Dried kombu (kelp) are softened in vinegar marinade before being shaved. It's added in various soup, rice, or noodle dishes. Chukamen noodles are used for ramen dishes. These noodles are generally made with wheat flour and kansui (alkaline solution) in Japan. Hanpen is a kind of fish cakes. It's very soft. Shirataki noodles are semi-translucent noodles made of konjac or konnyaku yams. Kanten is made from tengusa seaweeds. Tengusa seaweeds are simmered at first, and jelly-like materials are firmed and freeze-dried. Kanten come in different forms, such as sticks and powder. Steamed mochi rice (glutinous rice) is pounded to make mochi. Fresh mochi is soft, but it hardens quickly. Prepacked mochi blocks, which are flattened and cut into square pieces or shaped into rounds are available at grocery stores. It's glutinous rice flour which is used to make dumplings. Domyojiko (glutinous rice flour) is usually used to makes traditional sweet cakes in Japan. Kuzuko is the starch powder made from kuzu or kudzu plant root. It's used for thickening sauce or making dumplings. These are simmered sweet chestnuts in syrup.